best bouncy castle company around, always on time, totally reliable and great service!!!! will keep using for all our functions @ the busy bee in skelmersdale!!!! Very helpful, ilnerdibcy responsive, friendly, and competent in restoring my Word Press website. You were just what I needed. I am pleased to have made your acquaintance and look forward to working with you again. Thank you for the castle, It was refreshing to deal with such amazing staff, Not only was they friendly they set the castle up so fast. My little girl had a wonderful day thanks Lorna. james bound bouncy castle liverpool. 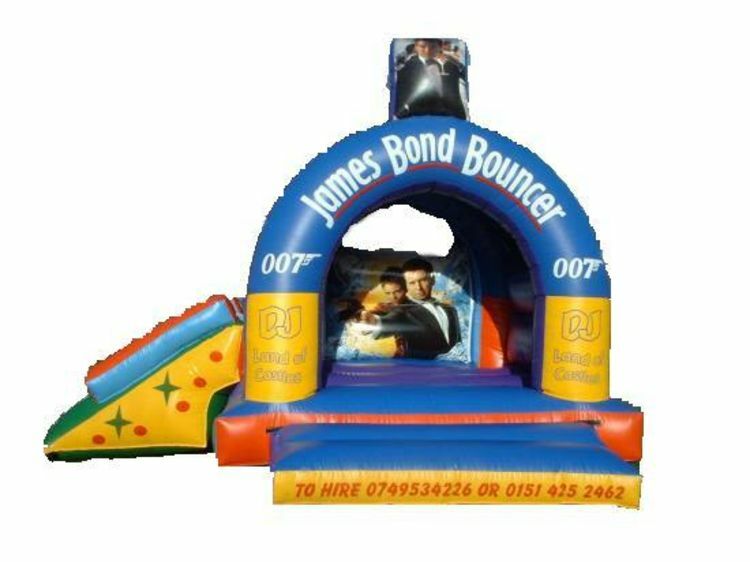 Our 15ftx17ft james bond slide bouncy castle features amazing artwork of jame bond on the walls and '007' and 'Dj land of catsles' writing on the arch of the bouncy castle also it has a 3ft slide coming of the slide of the castle.This themed bouncy castle has a raincover so whatever the weather you can still have fun on our James Bond slide bouncy castle.The required space you will need is 17ft x 19ft,the height of this bouncy castle is 11ft.If the bouncy castle is going indoors,please ensure the celing height of the venue where the bouncy castle is going is higher than the bouncy castle.We deliver our themed bouncy castles, inflatable slides,rodeo bull hire,plus are assault courses and adult bouncy castles and domes,to Merseyside & Liverpool, Widnes, Runcorn, Wirral,Warrington, and St Helens, and some of these areas and further areas will be a additional fuel charge or toll/tunnel charge.Check our delivery checker on our home page,it will tell you if there is a charge for your area.